5 Reasons Why Women Should Ride In Peoria. I love setting goals, and occasionally meeting them, but mostly the setting part. I love giant outbursts of enthusiasm. Of excitement. Of a rejuvenated spirit. So when classes ended in May, I had lots of time and consequently goals. I drove home in Scotty, my premium-gas guzzling 1995 Mercedes and grabbed my whiteboard to make a list of summer goals. I sloppily scrawled: Ride 500 miles. This objective seemed do-able. Entirely. Except I hadn’t ridden my bike (a blue boys mountain bike I bought for like thirty bucks) in months. Even then, I could count the number of times I had ridden it on one hand. But hey, my utter HATRED of spending money on gas was so grand that bike riding seemed perfect. My first trip was to the bank. Alone. On a major street. It was 5 miles round trip and SPOILER ALERT I survived. 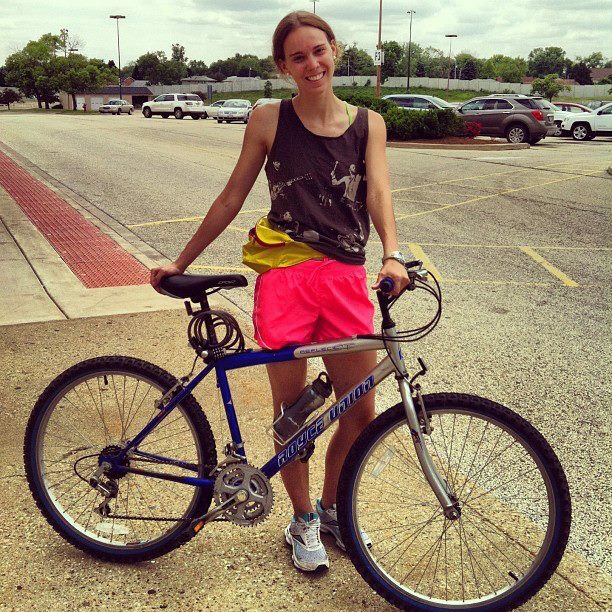 Which got me thinking: biking is totally rad! Not only can I get where I want to go, but I can also get there for free and get a free tan (albeit one with freakish tan lines)! 1. Groups are great – but so are solo adventures! I love the out of the box ride ideas put on by the Pedal Peoria Series, the Peoria Bike Summer, and the Illinois Valley Wheelm’n but I sadly haven’t actually been able to attend any! If I waited to schedule all of my rides with local groups or friends I would NEVER reach 500 miles in 106 days. Which is why I started riding to each planet in Peoria Riverfront Museum’s Community Solar System. I also started riding to all the local ice cream parlors in Peoria! It forces me into areas of the city I’ve never been while racking up those miles. 2. Someone almost makes you road kill? Throw them a genuine smile. I like to think I am a cautious rider who follows [most] traffic laws but that doesn’t stop me from almost getting hit each time I go out – even if I am on the sidewalk! And can we blame the drivers in Peoria? We are not known for being a city that encourages or boasts a high biking population. So these poor folks are simply not used to sharing the road with us. Rather than giving them a dirty look, consider smiling so they understand we are here to stay and look forward to developing better bike-car relationships. Wow, that got corny. But true nonetheless. 3. You don’t need EVERY piece of biking equipment EVER. I get that everyone is different and requires unique products to help them feel safe while riding. However, your bike doesn’t need to be decked out in everything sold – not to mention how pricey it can be. Stick to the basics: helmet and proper shoes. That’s really all you need to be safe. With that said, I also have invested in a speedometer/odometer sold by Cat Eye and a Yakima bike rack. For my goal I need to know mileage and getting outside of the city limits can make for more peaceful riding. I personally don’t mind the hand blisters (now calluses) and sore tush that comes from riding daily. But if you are letting those things hold you back, then ride to Bushwacker and pick up some gloves and a softer seat. And don’t be afraid to bike in clothing you want to. Believe it or not, sports bras are actually socially acceptable and so much cooler. 5. The best way to make Peoria bike friendly is to ride even when it’s not. We can hope for new bike lanes and racks till the cows come home but we will never be Seattle. Who cares? Get out there today. Ride on the road or the sidewalk. Lock your bike to a stop sign or a fence. But whatever you do, make your presence known because you have as much of a right to be on the road as a car. I look forward to seeing you all on the road as I get closer and closer to my goal every day. In case you were wondering, miles remaining: 261.79. Not bad for a chick who started riding in May. Kelsie is a Peorian, born and raised, entering her senior at Bradley University studying Public Relations and Studio Art. You can follow her biking shenanigans at seventysixspokes.tumblr.com or @kelsiebarnhart on Twitter.